In his debut YA series, Patrick Ness, takes us to Prentisstown; an isolated settlement where the thoughts of men, boys and animals( known as the Noise) are constantly broadcast for everyone to hear. Women don't give off the Noise, but that’s no matter because there are no more women. They were all killed by the virus that created the Noise. Or so 12-year-old Todd Hewitt, the youngest boy in Prentisstown, has been lead to believe. Weeks away from turning thirteen and becoming a man, Todd has to run for his life and discovers nothing is at all what he knew. I picked up and put down this book a couple of times, I really had a to adjust to the setup. Right from the first page Todd's dog Manchee is talking to him which was just weird, but I kept coming back because I had heard amazing things about this novel. Then it turned out the meat of this book falls into my least favorite category of YA fiction, the "kids in the woods" variety. I just can’t get into the survivalist fiction, these stories never do it for me. But the world and questions Ness built into the story kept me so captivated that I was racing to the the end. Ness has certainly created a dynamic world, he does some interesting things narratively. Todd's first person narration is written with a strong dialect and because he hasn't been to school words will often appeared misspelled like confushun or desperashun. Ness and the publishers also worked out some interesting ways to display what the Noise sounds like on page. It was a little annoyed how the plot involved Todd carrying around an Idiot Ball for most of the book. In the novel, he is given a journal and told all the answers he needs are in there. But he never reads it. Even when he has someone to read it to him. And there were a few other things that didn't make sense, that I’m sure get explained in the next novel. 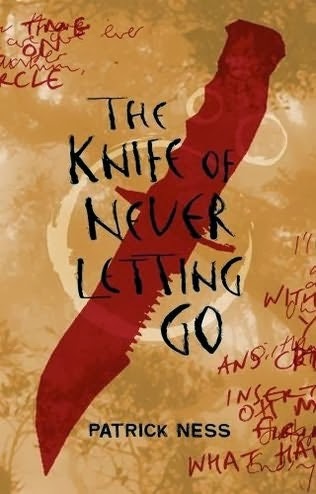 While I liked the book and Ness' world building and writing, I’m not ready to read more of The Chaos Walking series. I think I'll check out Ness’ standalone YA book, More Than This. I tried this on audio and it was just too confusing with all the Noise being read inside my head! I have the paperback and I do want to try it!